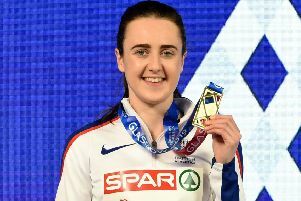 Laura Muir wants to be pushed to the limit at today’s Diamond League meeting in Birmingham to drive her towards another record. The newly-crowned European 1500 metres champion will gun for Kelly Holmes’ long-standing British 1000m best of 2:32.55 in what is set to be her penultimate appearance of the season. But even though the Scot is arriving on a high from her dominant performance in Berlin last weekend, it could take a mass scramble for victory to see her clock her target, she claims. “In Berlin I ran the last kilometre quite hard which is good preparation for this,” she said. “As long as the conditions are good, I feel on target to go for the record. When you’re right on the limit and when it comes down to getting it within a second or so over a long distance, the pacing has to be pretty spot on. I’ll have to run it a perfect way and manage the conditions. European 1500m bronze medallist Jake Wightman admits he’s chasing the cash by dropping down to 800m at the event. Triple European champion Asher-Smith insists she has nothing to prove when she returns to the track. The 22-year-old became the first British sprinter to win the 100m, 200m and 4x100m at a major championship when she won all three at the European Championships last week. She lines up against a world class field in the 200m today including 400m Olympic and 200m Commonwealth champion Shaunae Miller-Uibo, who is yet to lose this year, Netherlands’ 200m world champion Dafne Schippers and Marie-Josee Ta Lou, who won 100m silver at last year’s World Championships. But Asher-Smith, who recorded three world leading times last week, is comfortable after her historic treble victory in Berlin. “I am pretty satisfied in what I did in Berlin when it comes to putting down a marker,” she said, having also defended her 200m European title. “At the end of the day we all need to be able to run fast times but the most important thing is to do it in finals when the pressure is on. “I was very happy to do two personal bests in two championship finals so the rest of the season is just about having some fun and seeing what else I can do now. Fellow sprinter Hughes takes on Lyles, the fastest man in the world this year over 100m, 2011 world champion Yohan Blake, 60m world record holder Coleman and 100m Commonwealth champion Akani Simbine.